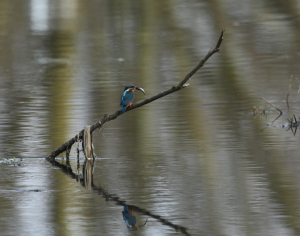 Observation - Female Kingfisher on a Successful Fishing Trip - UK and Ireland. Description: This is a fair sized fish for a small bird. It beat it several time on the perch, eventually flew off with it. The bird passed me several times as it went up and down the river. Quite vocal, too. This is a fair sized fish for a small bird. It beat it several time on the perch, eventually flew off with it. The bird passed me several times as it went up and down the river. Quite vocal, too.